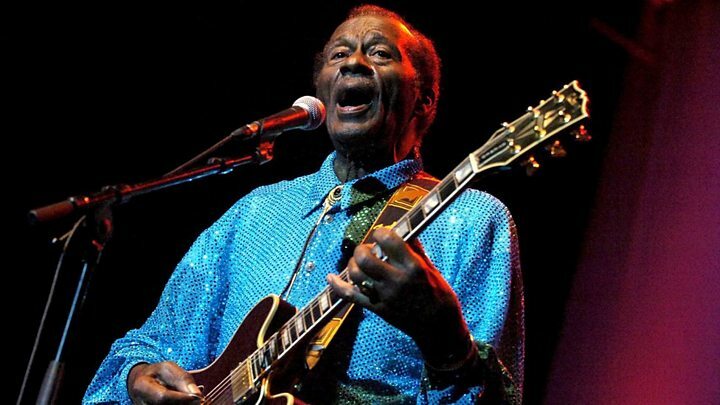 Musical stars are paying tribute to Chuck Berry after the influential performer died aged 90. US singer-songwriter Bruce Springsteen said he was "the greatest pure rock 'n' roll writer who ever lived". Mick Jagger of the Rolling Stones said Berry "lit up our teenage years, and blew life into our dreams of being musicians and performers". The guitarist and songwriter died Saturday in the US state of Missouri after a seven-decade career. Seen as one of the fathers of rock 'n' roll, he influenced generations of succeeding musicians, most notably The Beatles, the Rolling Stones and the Beach Boys. Beatles drummer Ringo Starr quoted one of Berry's own lyrics on Twitter, saying: "Just let me hear some of that rock 'n' roll music any old way you use it." He wrote he was playing Berry's 1961 song I'm Talking About You, which was recorded by The Beatles at the BBC in 1963. Singer-songwriter Huey Lewis described him as "maybe the most important figure in all of rock and roll". "His music and influence will last forever," he added. Rocker Alice Cooper tweeted that Berry was "the genesis behind the great sound of rock 'n' roll". "All of us in rock have now lost our father," he said. Motown legends The Jacksons tweeted: "Chuck Berry merged blues & swing into the phenomenon of early rock'n'roll. In music, he cast one of the longest shadows. Thank You Chuck." Berry was known for trademark four-bar guitar introductions and quickfire lyrics that reflected the rebelliousness of 1950s teenagers. His hits included Johnny B Goode, Roll Over Beethoven and Sweet Little Sixteen. However his only US and UK number one hit was My Ding-a-Ling, a novelty song replete with innuendo that was recorded at a gig in Coventry in 1972. His death was confirmed by police in Missouri. Media captionListen: Chuck Berry was "a magical man" who was "enthusiastic about life". Both The Beatles and the Rolling Stones covered Berry's songs, as did the Beach Boys and scores of other acts - including Elvis Presley. "If you tried to give rock 'n' roll another name," John Lennon once said, "you might call it 'Chuck Berry'." 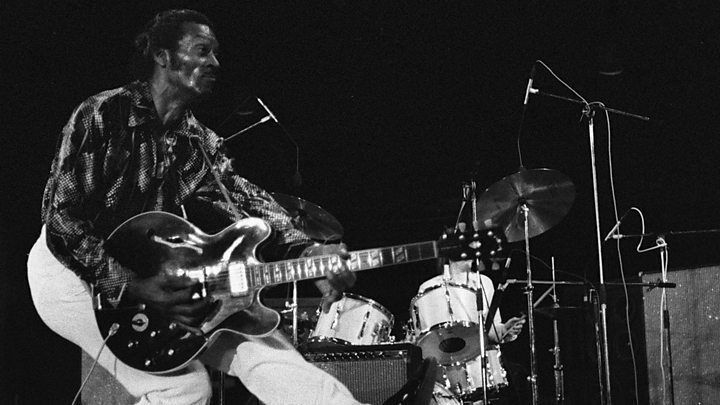 The novelist Stephen King noted that Berry had a long life for a consummate rock'n'roller, tweeting: "Chuck Berry died. This breaks my heart, but 90 years old ain't bad for rock and roll. Johnny B. Goode forever." Berry was born in St Louis, Missouri, in 1926, and had his first hit, Maybellene, in 1955. He went on to score a succession of hits that were aimed at adolescent audiences, transcending the colour bar that plagued many contemporary black artists. Last year, he announced he would be releasing his first album in nearly four decades. He dedicated it to his wife of 68 years, Themetta "Toddy". The album, entitled Chuck, was recorded in St Louis, Missouri. It will be released later this year, though a date has not been set. How has his music inspired you and affected your life? Are you a fan of his so-called duck walk? Email haveyoursay@bbc.co.uk with your stories.